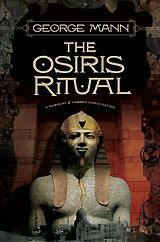 Turbula - Culture - Book review: "The Osiris Ritual"
The second in the Newbury & Hobbes Victorian steampunk mystery series, "The Osiris Ritual" is another face-paced yarn that shows author George Mann is very likely onto something special here. Following the events in "The Affinity Bridge" (in which robot-piloted dirigibles began crashing all over early 20th-century England), British Museum curator Sir Maurice Newbury is assigned by Queen Victoria (kept alive by a giant breathing apparatus and other medical technology) by track down a rogue royal agent. At the same time, Newbury's assistant, Miss Veronica Hobbes, is trying to figure out who is behind the disappearances of young women in the London area. And the unwrapping of an Egyptian mummy by an aristocratic explorer unleashes yet another set of myseterious events. Newbury is a likeable but deeply flawed character, with a drug habit he just can't kick. Hobbes has secrets of her own, and the two of them have a very definite chemistry. While the narrative feels a bit rushed at times  Mann's alternate-history universe in which steam engines are dominant over internal combustion ones deserves a richer exploration  the story lines are decadent, and Mann has a deft touch at pulling everything together in a way that leaves each installment feeling complete, but also has the reader wanting more. "The Immorality Engine" is already out in Great Britain; here's hoping for a quick release to the U.S.